will guide you through the complete Elvis Presley Recordings. There's a guide to Elvis' albums in The Elvis Collection. 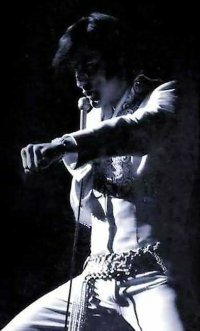 You'll find an overview of Elvis' Awards and the complete history of Elvis' Live Concerts. You'll be guided through all of Elvis' movies and TV-shows in our Filmography. The Bibliography shows a selection of books about Elvis. There's also a search engine to search the guide. We have elmiro updates and Links. To contact us use one of our contact-forms. If you want to be informed , when a new update is launched, we offer a newsletter-service. See all this on Elmiro - The Elvis-Guide .